Due to discontinuance of ten-ruble note (they were substituted with coins) Ringing Cedars of Russia company applied a new method of counterfeit protection. It includes assigning a unique registration number to every product. You can find this number on the "best before" sticker at the bottom of each product box. Also the product box contains company’s booklet. On this page you can verify the authenticity of the product which you have purchased. 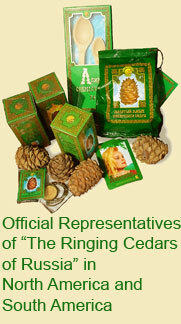 If your package with the Siberian Cedar Nut Oil does not contain the items above, then your Siberian Cedar Nut Oil is not genuine.